Press home your attack with the superior frontal armour to protect you and either the 75mm or 76mm gun to keep your enemies on their toes! Knowing D-Day approached, and in order to assault fortifications, the US army looked to ‘upgrade’ the standard M4A3 Shermans. 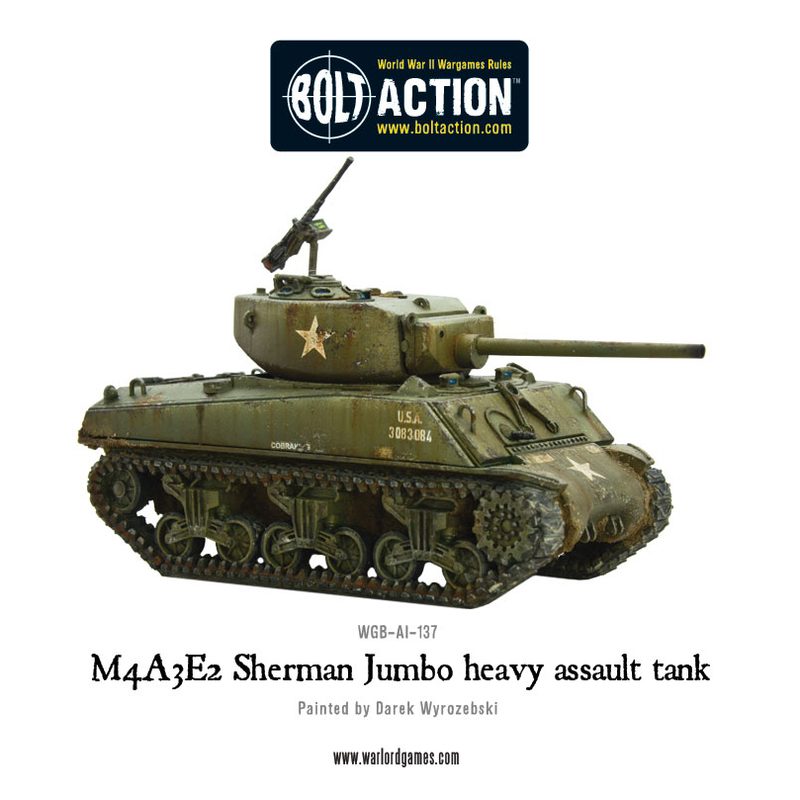 The resultant tank arrived in the June–July 1944, with the US Army receiving a limited run of some 250 M4A3E2 Jumbo heavy assault tanks. Equipped with very thick (100mm) frontal armor (glacis plate), sloped at a steeper angle than normal to eliminate the hull bulges on the standard glacis, and a further 150mm of armour to the front of the turret. It was praised for being the only US tank able to survive a direct hit from a German 88. The 43 ton heavy assault tank arrived armed with the reliable 75mm gun in a new, heavier, T23-style turret. 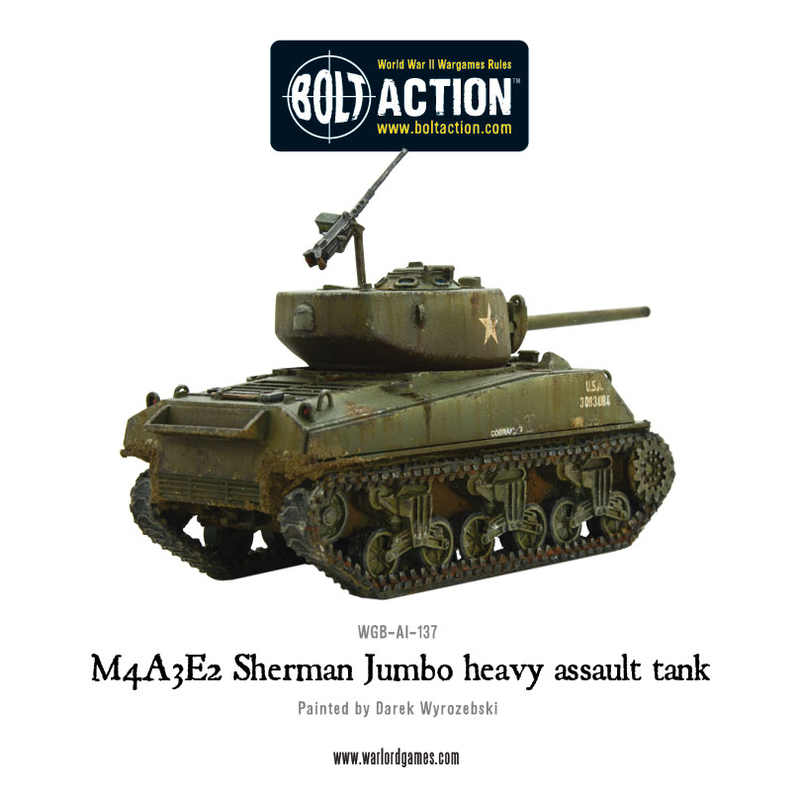 As the Americans gained more bitter experience against the heavier armoured and better gunned German tanks the call went out to re-arm all the M4s to the 76mm, this project would eventually be canceled due to the many difficulties presented by the small turrets of the M4, the Jumbo however had the larger turret already, so in February 1945 Patton’s third army was to refit in field workshops (adding the .50cal mount at the same time to replace the older .30cal). 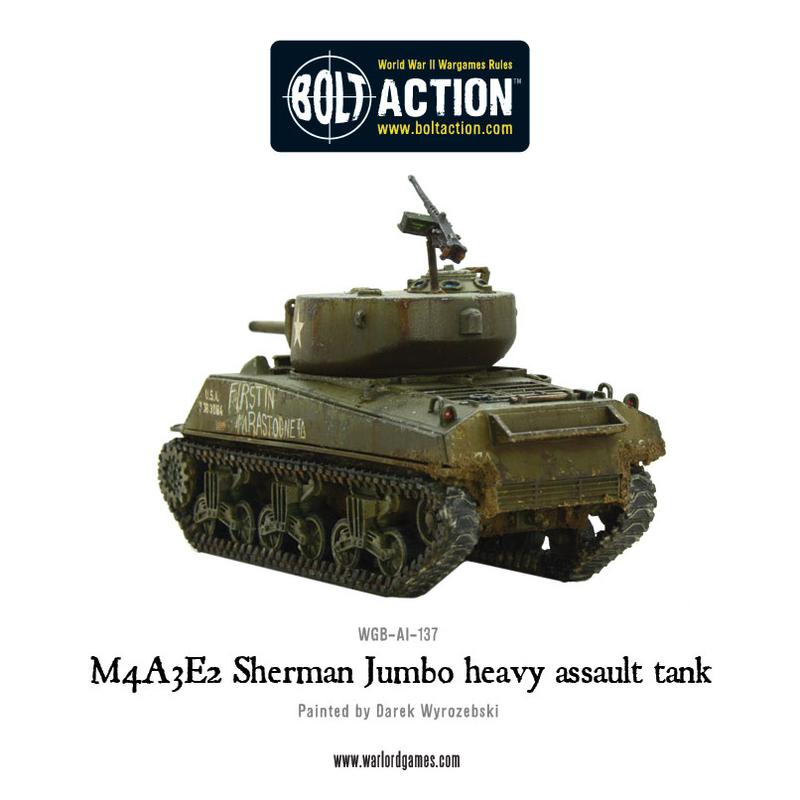 Eventually other armies followed suit and some 100 M4A3E2 were converted with the new 76mm. This beast has a good chance of survival and has a psychological shock value you could use to your advantage. Look to advance ahead of your infantry, making use of the superior armour to make direct assaults. Cost: 212pts (inexperienced), 265pts (Regular), 328pts (Veteran). Weapons: 1 gyro-stabilised turret-mounted medium anti-tank gun with co-axial MMG and forward facing hull-mounted MMG. May add a pintle-mounted HMG on the turret for +25pts . May exchange the 75mm medium anti-tank gun for a 76mm heavy anti-tank gun for +35pts (losing the HE special rule shown below). HE: instead of causing D2 HE hits, an HE shell causes D6 hits (75mm gun tanks). Easily catches fire: If a roll on the vehicle damage table results in the vehicle catching fire add D3 pin markers rather than just 1 before taking a morale test. 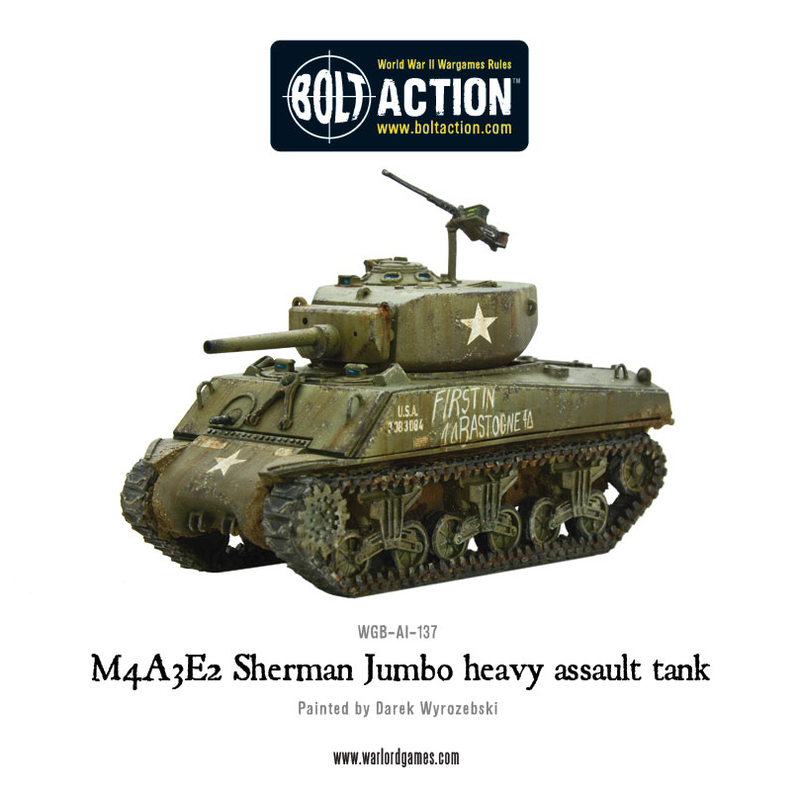 Slow: a Sherman up-armoured to a heavy tank is slow – its move is reduced to 6”advance and 12” run.